I have lived in the city since college, and there were many things that drew me to the city. I loved the neighborhood shopping districts, the eclectic restaurants, the small art galleries, the diverse people, and the independent bookstores nestled among quaint neighborhoods. I was always inspired by one of my favorite Woody Allen movies, Hannah and Her Sisters. 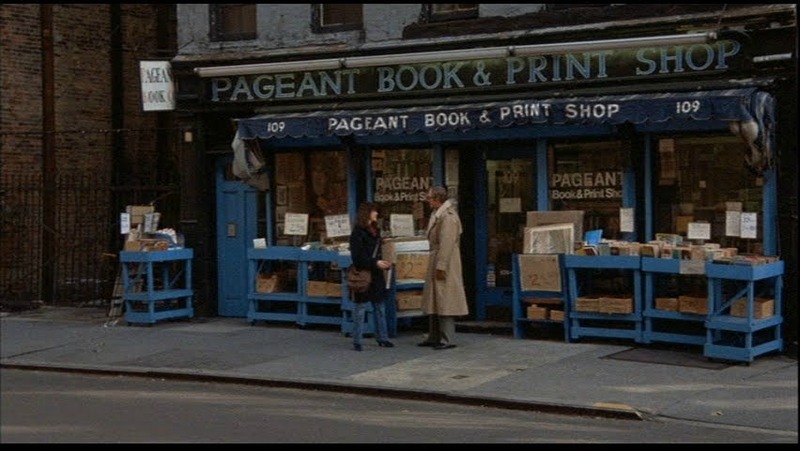 Remember that scene where Lee takes Elliot to a great, eclectic bookstore where he buys an e.e Cummings book for her? That shop looked so cool, and reminded me of another bookshop I stumbled into during my visit to Paris that was dusty, cluttered, off the beaten path and full of treasures! 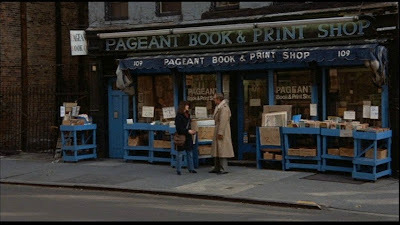 Sadly, this bookstore in New York (see pic below) is now a fancy Pub and Grill. My point is made. 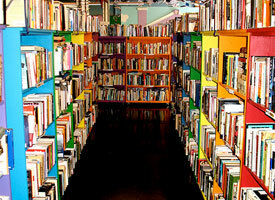 Enter the big box chains, and out went many independent bookstores. They are not easy to find any more. Now, with the addition of digital readers and Amazon, will brick and mortar bookstores survive? And the other question is, what happens to all the paper books? As more people downsize to digital readers, paper books need homes. But it is harder to find places that actually take used books for donations. Our public library system in Chicago does not take donated books. But a wonderful librarian, who I will thank forever, told me about Open Books, who does! Open Books is a nonprofit social venture that operates an extraordinary bookstore, provides community programs, and mobilizes passionate volunteers to promote literacy in Chicago and beyond. And their "hub" is their amazing book shop. When I walked around, browsing around their shelves, I did not want to leave. The place just has great karma. It is not "dusty and cluttered" but bright, colorful and clean. 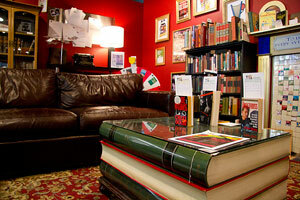 There is a nice lounge area with cushy couches where you can flip through a book. There is a great children's area in the back where they feature story times for children. All the books are donated and funds go toward their literacy and writing programs. They will take books for all ages, and those that don't get sold in the store, they find other homes for within the community. Volunteers work the shop as well as their programs. It is a pretty amazing place and organization. Please do stop by the store if you are ever in the city! 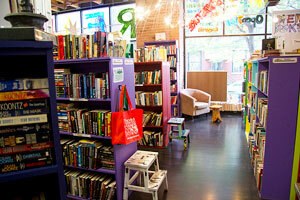 It is everything that an urban book store should be and more. Browse their shelves, buy some books, get cozy in their lounge. If you are in the area and have old books to toss, please drop them off here. Those used books will do so many good things on so many levels. If you have a local book shop in your neighborhood, please support them. They are a rare treasure, and add to the fabric of our culture and community. 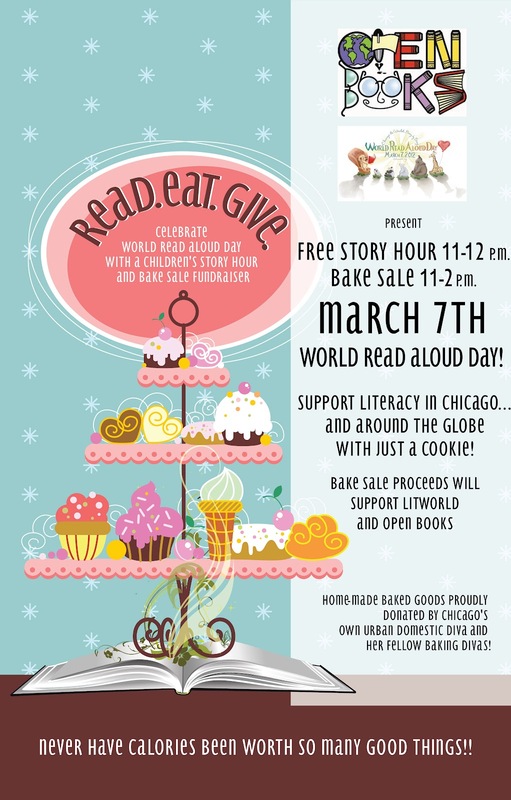 I am so proud, excited and happy that they agreed to celebrate World Read Aloud Day tomorrow with me! 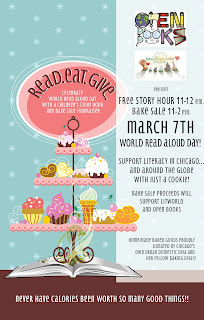 We will co-run a bake sale there and a story hour! So stop by tomorrow! You can cozy up with a book and a home made cake pop or Samoa brownie made by yours truly for $1! As you know, I am dangerous in the kitchen, and I would love to see you!